I was very sad to see Google+ event header images usage in Google Calendar being dropped by Google in 20016/2017. I though it was by far one of the best bits about Google+ events. 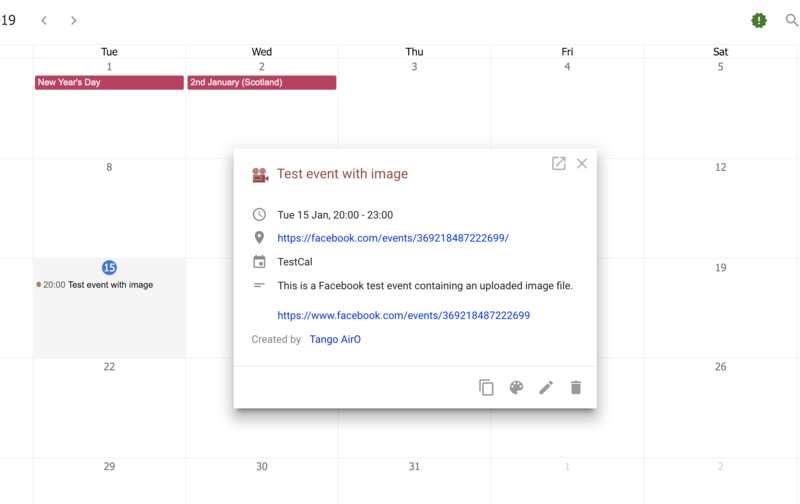 Upon accepting an event not only would it automatically create an entry in Google calendar, but it would display the Google+ event header image as part of the calendar popup and event data. They dropped the popular header image functionality and introduced the somewhat gimmicky "keyword" images instead. 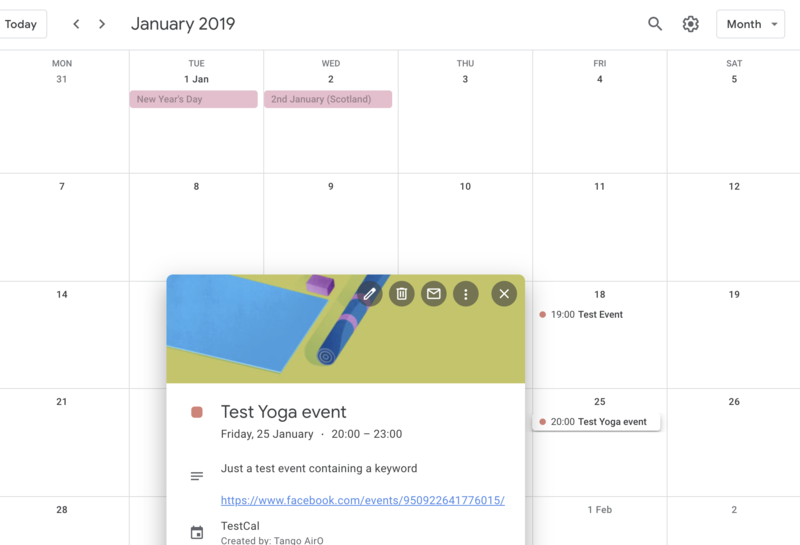 I nearly fell off my chair not knowing whether to laugh or cry and after the next Google+ facelift they made it virtually impossible to even find the G+ events (buried under the ⋮ menu dropdown on profile page) which could not be any more hidden. It's probably what killed off G+ events altogether. Anyhow back to Checker Plus. 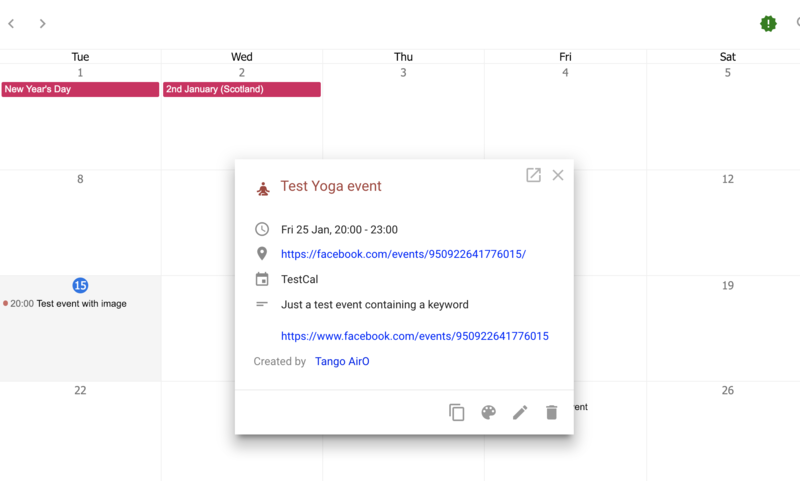 When I create a Facebook event with a keyword, say "yoga" as in my test event (first screenshot), and import it using Checker Plus it shows the entry with an "eventicon" (yogi) on the top left hand corner of the popup suggesting an associated keyword detection, but it does not display the associated keyword image like it does on Google Calendar (second screenshot). 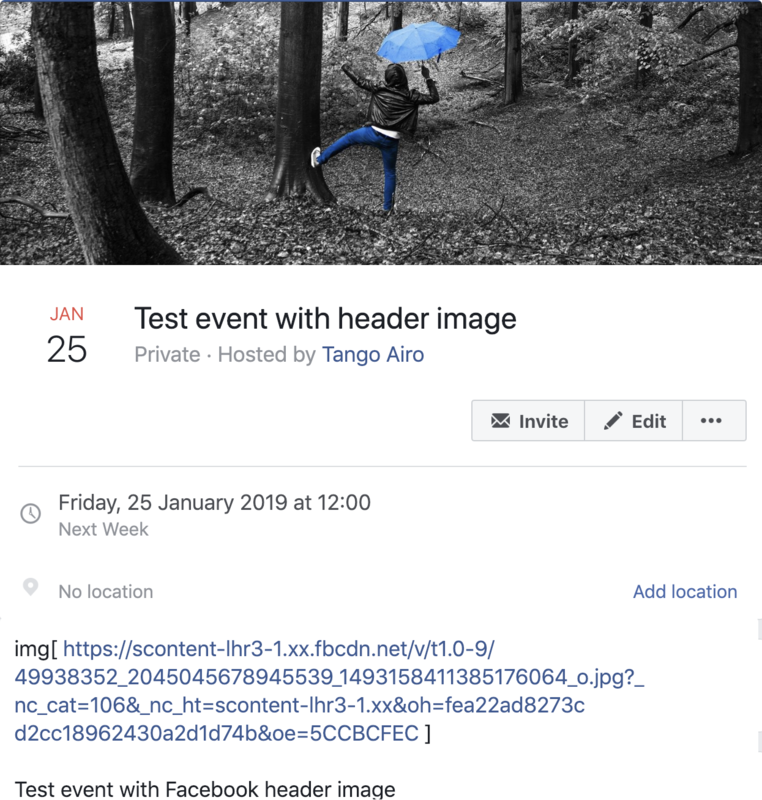 Also I've noticed that Facebook events which contain an uploaded image (third/fourth screenshot) show up with an "eventicon" that looks like a film recorder, but I am unsure what it is supposed to denote as no image file/link came across as part of the import. 1) Display keyword images in the Checker Plus popup.html like they currently appear in Google Calendar and not just an "eventicon"
2) Bring across Facebook images or links (perhaps stored elsewhere or possibly using existing facebook image URL) as part of the Checker Plus Facebook import and display them in place of the keyword image. Essentially this would reinstate the previous popular Google functionality that was annoyingly dropped for whatever reason back in 2016/2017. PS I tried to dig up an old event example to take a screen shot showing a Google+ event entry with the header image I created back in 2016 but unfortunately although the event still exists the image is no longer displayed on the Google event. I am pretty certain that it is the correct calendar entry as it still lists the organiser as 1139665...1751589@profile.calendar.google which is the ID of the Google Community where the Google+ event originated. 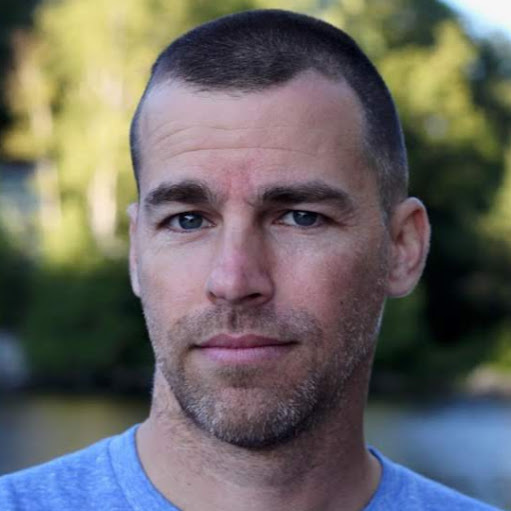 I'll take note of this, but realize that most people use my small popup window from the top toolbar icon and the limited size does not leave much room for an image above the details. Hence whey I opted for the original event logos. As for the video logo, you happened to use the words "test event" which are the same words used to demonstrate a test event in my options. Try changing either one of those words and that test event video icon should not appear. Ah! Yes if viewed from the "popup" window and not the "popout" (expanded view) it probably would look quit odd I imagine.